Gold's Gym Utah: Help us make someone’s Christmas this year! 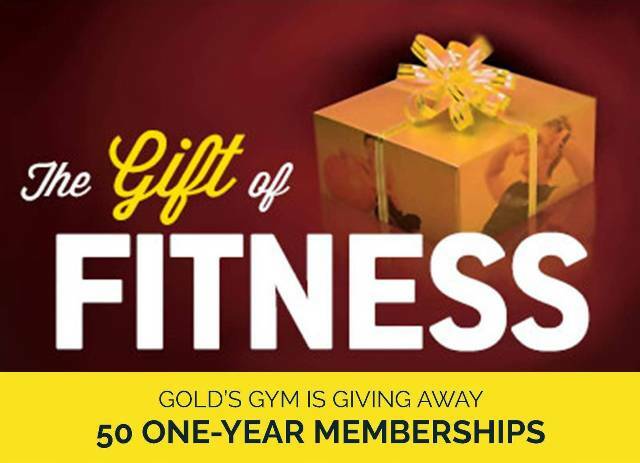 Gold's Gym Utah will be giving away 50 FREE 1-year memberships to individuals who reside in Northern Utah and are nominated. Please nominate a praiseworthy friend, neighbor, or family member that could really benefit from a FREE 1-year Complete membership to Gold's Gym Utah. Nominations must be completed prior to December 15th at midnight. *Odd’s of winning depend on number of entries submitted. Nominees will be judged by Gold’s Gym staff. No purchase necessary. Must be 16 or older. Membership applies to Weber/Davis County Gold’s Gym Utah locations only (Gold’s Gym Ogden, Kaysville, Roy, Layton, & Syracuse) See club for complete details.